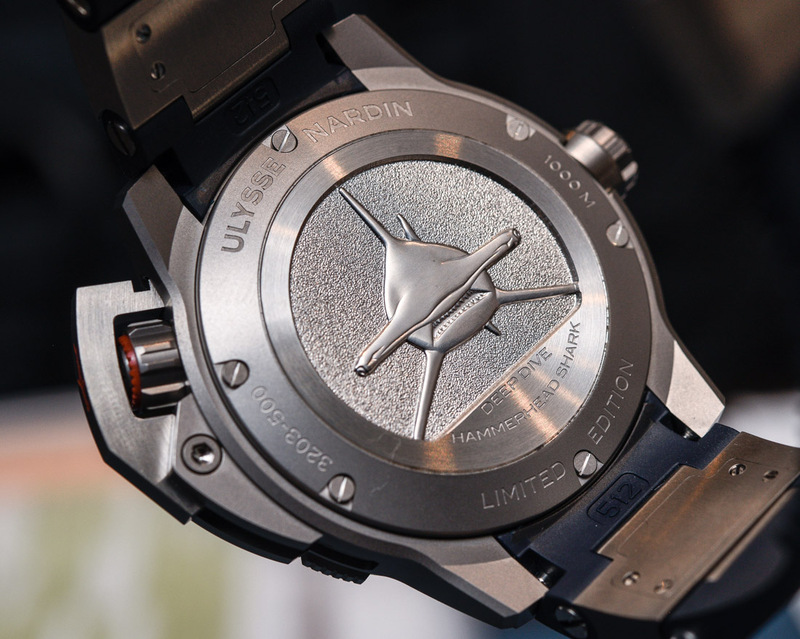 Ulysse Nardin sure knows how to go charmingly overboard with design. The creators of the Freak often combine aggressive styling with upscale horology in their varied collection of sport and dress watches. In recent years, UN have also expanded their selection of diver’s watches with their Marine Diver, vintage-styled Diver Le Locle, and Diver Chronograph Artemis Racing. 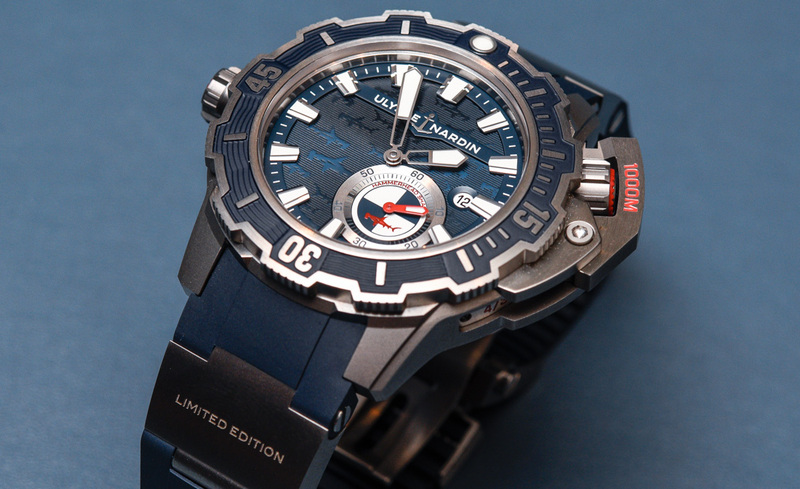 In an effort to further expand their collection of densely appointed diver’s watches, Ulysse Nardin just released the repetitively named Ulysse Nardin Diver Deep Dive Hammerhead Shark Limited Edition, a 46mm, in-house caliber-powered diver’s watch with 1,000m of water resistance. 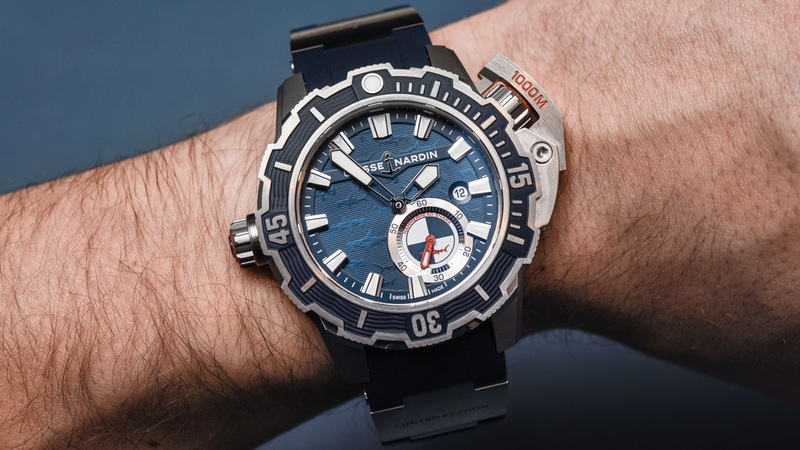 Here, we’ll go hands-on with the new watch to find out whether it’s better suited to use as a dive timer or a boat anchor. 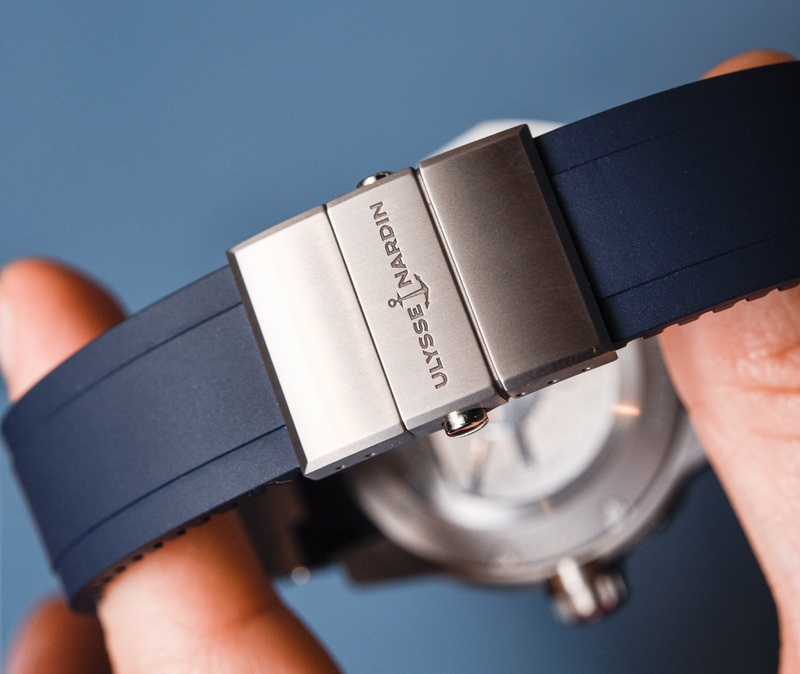 Starting with the case, the Diver Deep Dive is housed in a 46mm wide block which is produced in titanium to keep the overall weight down to acceptable levels. 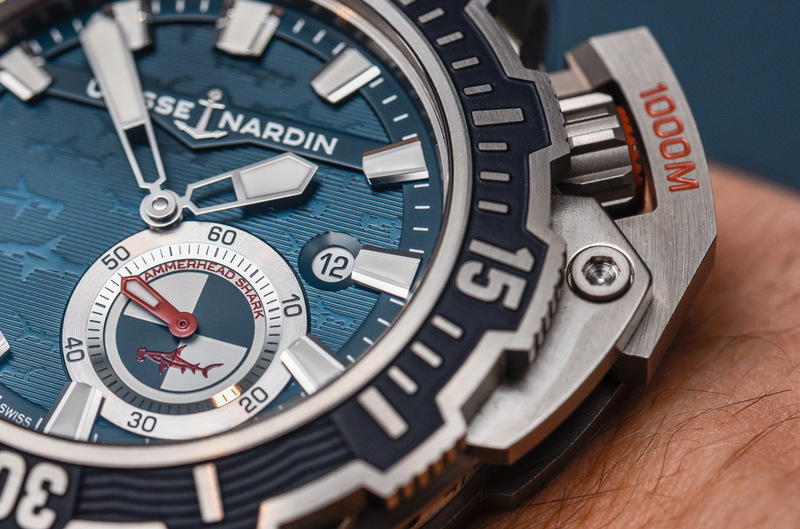 At nine, the Diver Deep Dive has a totally-unnecessary-but-cool “automatic, screw-on decompression valve system,” which is Ulysse Nardin’s language for a helium release valve. This little screw-on attachment also has a thin, red rubber ring just outside its “He” signed center. While I won’t go too deep into it here, a helium release valve is a way for helium gas to escape from inside a watch as its wearer, a professional saturation diver, is decompressed from working depths inside a saturation system. If you’re not one of those people, and you almost certainly aren’t, this little valve does you absolutely no good other than looking cool – as I would argue it does here. At two o’clock, a large screw down crown, also sporting a red rubber ring, sits beneath a proportionately large fold over crown guard in a style reminiscent of the Luminor from Panerai. The crown guard is engraved with “1000M” in red on its front facing surface and also decorated with a little hammerhead shark motif on its side. At the other end of the crown guard, an engraved limited edition number, also in red, is exposed. 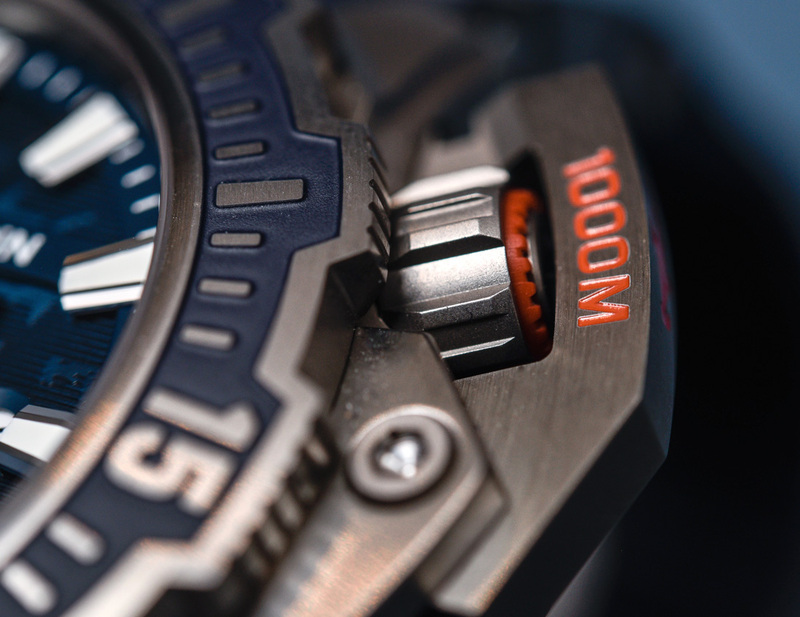 A wide, titanium, unidirectional diver’s bezel, partially covered with wave patterned rubber, aids in the diving tool argument and is deeply machined at its circumference for grip. 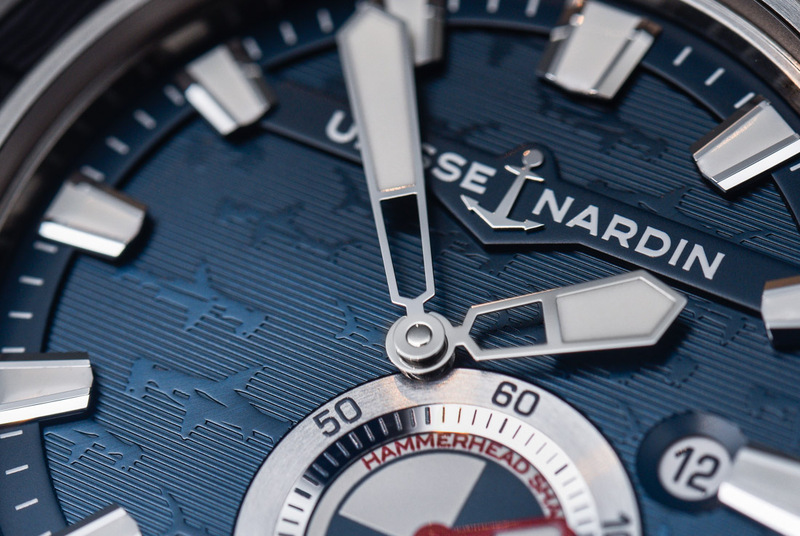 Perhaps my favorite aspect of the case is actually the screw-down case-back, which is engraved with a head-on view of a hammerhead shark, a visual theme which, as I’ve mentioned, repeats itself throughout the watch. Our troops from the ground at SIHH (namely David, who took these images and handled the watch) reported back on the Diver Deep Dive not only having a ridiculously bad name, but also some very, very sharp edges on its case. Some edges of the bezel and especially the crown guard had what felt like raw, machined edges as sharp as the CNC would leave them. 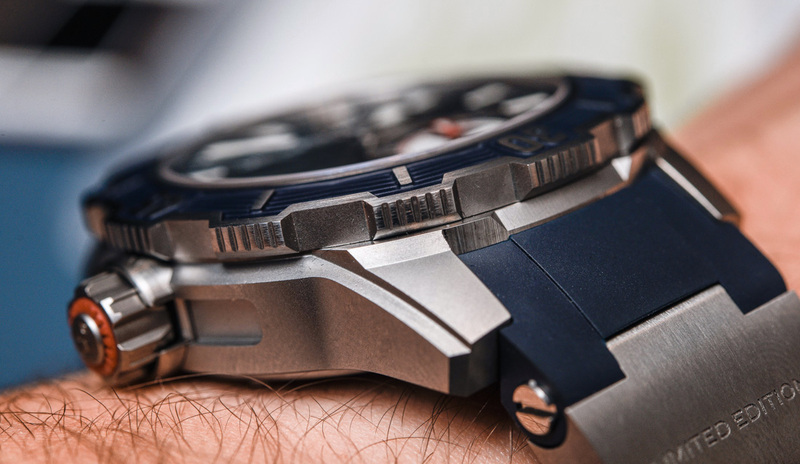 Though a luxury watch, in our shared opinion, should not have any sharp edges like these anywhere, here they were to be felt prominently on a range of edges. We wouldn’t call it dangerous – but we sure wouldn’t want that sharp edged crown guard catch on the side of a leather bag or jacket. This is one area UN should by all means fine tune. 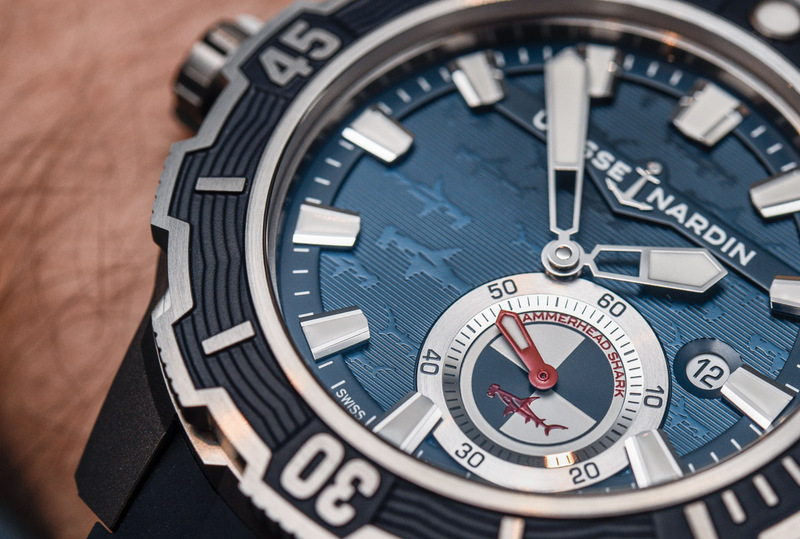 The Ulysse Nardin’s navy blue dial is embossed with 15 (I counted them) three dimensional profiles of hammerhead sharks. Large, applied luminous hour markers and skeletonized hands keep the diver’s watch theme alive while a large, off center, small seconds sub-dial, also emblazoned with its own hammerhead, tracks the seconds in the five o’clock position by means of a tiny, red lumed hand. A circular, black-on-white date window is also carefully tucked into the three o’clock spot. This dial, while I still have to call it busy, is actually not terribly cluttered, and it does a good job at keeping the dive watch-tool watch vibe strong – and not just with the sharks. 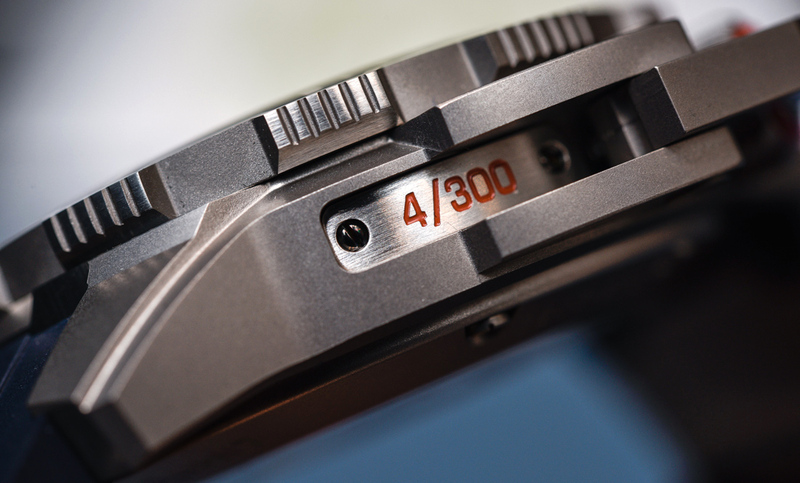 Having a clear, legible dial is key for a diver’s watch, and the Diver Deep Dive looks to deliver in that department, an essential for a diver to know whether his watch is running or not while submerged. However, giving the extreme likelihood this watch will never be deeper than the bottom of a luxurious pool, it’s not much of an issue. I can especially appreciate the three-dimensionality of it all, with the applied markers that stretch above the dial, or the bridge that carries the – mind you, nicely executed – Ulysse Nardin logo. The “Hammerhead shark” text is nothing but absolutely hilarious – as though it was to serve as a reminder so its wearer can tell what those creatures are on his watch, when asked at the bar. 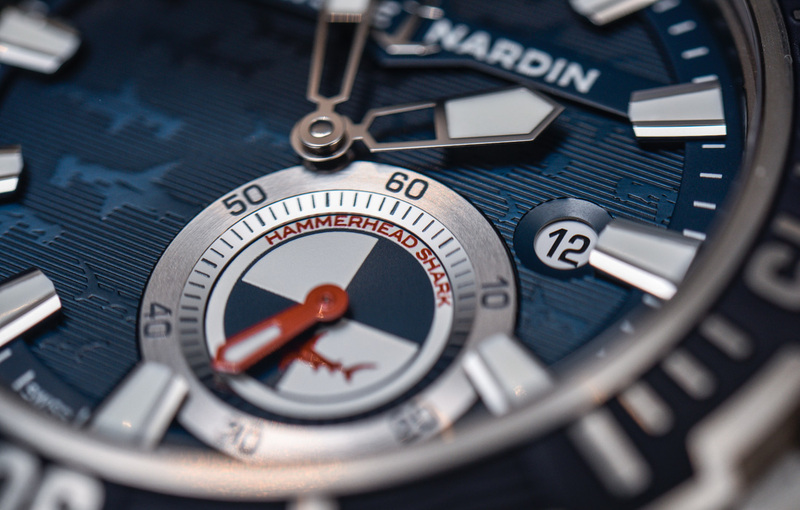 Straps are also key for dive watches, and the Ulysse Nardin Diver Deep Dive Hammerhead Shark Limited Edition is designed to meet the briny depths on a matching blue rubber strap with two inset titanium pieces, one near each lug. The titanium detail on the twelve o’clock side of the case is engraved with the maker’s name while the six o’clock titanium piece reads “Limited Edition.” A signed deployant clasp rounds out the strap, which is well matched overall to the look of the watch. The strap is to be cut to size which is not what we’d prefer, but it is true that once you get a strap like this down to fit, they tend to be more comfortable than those that have the excess length flopping around. 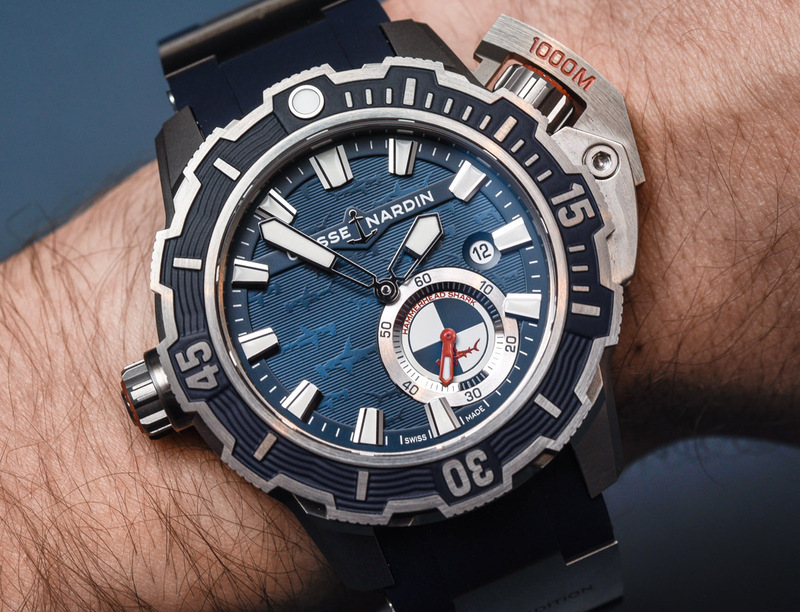 In keeping with Ulysse Nardin’s tendency in last years to include manufacture movements in their watches, the Diver Deep Dive features the UN-320 caliber, a silicium spiral and anchor escapement-equipped, totally in-house conceived and manufactured movement with 48 hours of power reserve. Ulysse Nardin see the 320 as something of a do it all automatic option given the UN-320’s inclusion in many of UN’s offerings in this price category. While the movement which keeps a diver’s watch going is generally of little importance to actual divers as long as it works, the inclusion of an in-house manufactured caliber in the Diver Deep Dive shows UN’s longing for independence and a consistently high esteem is taking shape.